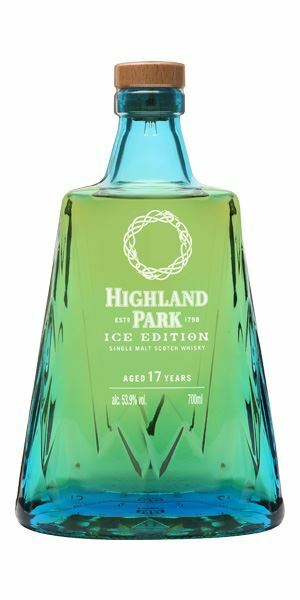 The bottle may not be to everyone’s liking but this week Dave Broom taste tests the new Highland Park Ice Edition, while heading back to the science lab with three Elementary bottlings from Grant’s. 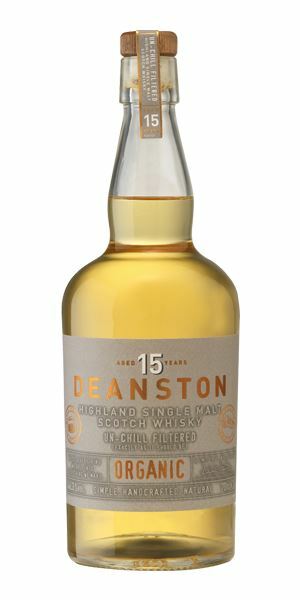 Also on the menu for this week’s tasting notes of new whiskies are the first organic release from Deanston and a cask strength Benriach. An immediate hit of fresh mango and lime alongside quite rich oak. It then shifts slightly into rhubarb fool, cinnamon pastries, custard, heavy honey, and cream toffee. There’s a fair whack of alcohol as well. Water brings out banana, wood oils, and cooked fruit. A big and substantial whisky and you need to be clever with the water to hit the ideal balance. 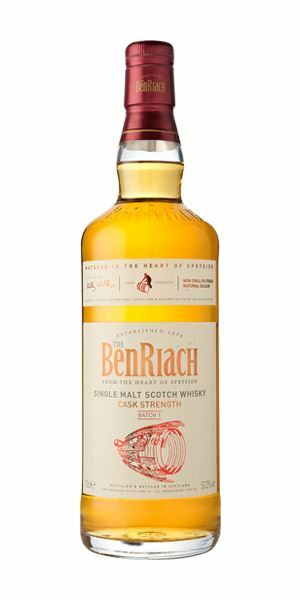 Has Benriach’s classic mix of cereal, tropical fruit, silkiness and spice. Quite indulgent, sweet with plenty of wood, but balanced. The strength will be an issue for many, but get the dilution right and you can see links to classic old Benriachs. A belter of a dram, and highly recommended. 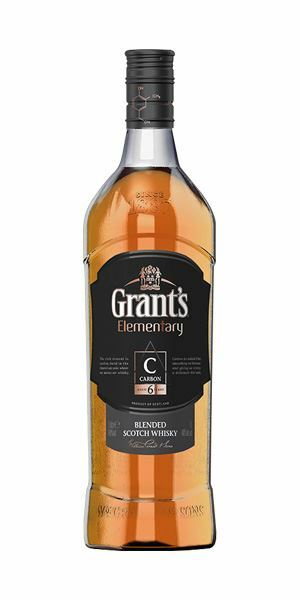 Utterly true to the distillery character (always a big plus) which starts with barley loft, then sweet mash before it moves steadily and sweetly towards honeycomb and with water a little apple skin and dry grass. Initially quite hot, like accidentally biting into white peppercorns. It softens relatively quickly (but does still need water) into cream and the sensation of cutting into freshly baked white bread. Bouncy and sweet. A little hint of char with water. A delightful spring-like dram. You can find it in travel retail and Germany. Lambs gamboling innocently in a field of buttercups. Good depth with sweet toffee, cooked fruits. A classically proportioned blend. There are hints of moist Demerara sugar and baked apples and the merest hint of smoke. Positive with more of the quite dense fruity elements, then toffee. A slight tightening at the end. It’s another decent and balanced blend and one which I‘d have with ginger ale. ‘C’ stands for carbon – hence the use of charred casks and peat. A spent bonfire in an orchard after pruning. Slightly sharp start, then a pleasing touch of Marigold gloves that gives way to lemon sherbet, French fondant fancies and hints of frangipani and lemon tree blossom. A little sweeter with water. Tight and focused – seems stronger than 40% and a background hint of soapiness. The mid palate is subtle, with cream over apple sponge but continues to be flighty. Water brings out some delicate and almost floral notes. A fresh young grain. The ‘O’ stands for oxygen by the way. It’s eight years old because oxygen is the 8th element. Clever, huh? Doing the washing up on a late spring morning. Excellent oxidised, mature notes with supple Moroccan leather, sandalwood and a thick creaminess before it moves into honey. Despite this things remain light. Lightly perfumed with a distant hint of lavender. 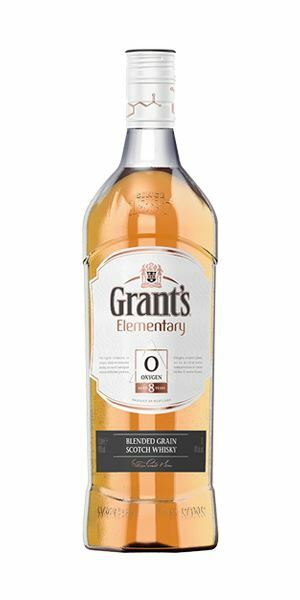 Gentle and discreet and therefore quite Grant’s. There is however a sense of fragility underpinning all of this and while it seems that water is needed just to remove a little heat it opens up the cracks. A delicate old blend which I enjoyed. Would I pay upwards of £200? No. 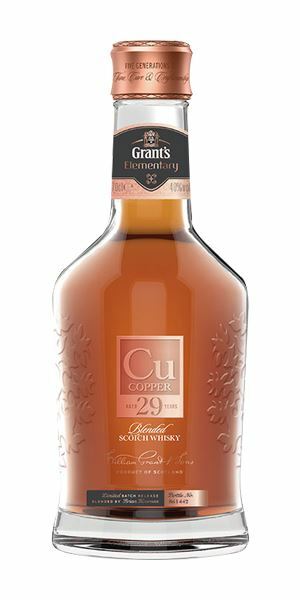 Cu is, as you know, copper which is the 29th element. I couldn’t help thinking what Grant’s might do with the classical fifth element [that’s aether by the way – and is the root of all alchemy]. Maybe they could employ Luc Besson as a consultant. HP in light guise with delicate smoke, some very fresh penetrating fruits – pineapple and pink grapefruit – then vanilla and some heat. The smoke puffs away in the distance. It’s a grower but you have to work at it. A little water calms things down, but you get the feeling you are on a knife edge where one drop too many will cause this ice shelf to collapse. Has a really sweet and slightly less forceful entry than you might expect. Medium weight with a feisty nature when neat, though that is shown to be anchored by an earthy element which then links to the smoke. Acidic, precise but hard to pin down. I figured it would make sense to try Ice with ice. It works, showing some delicate Sherry adding some sweetness and emphasising the yellow fruits but is it Highland Park? Quite short, light smoke and spice. Is it me, or does the bottle look like Superman’s Fortress of Solitude? I tried hard with this but struggled to work out what the rationale was here. Who else? The real Iceman cometh. Ice Ice Baby! 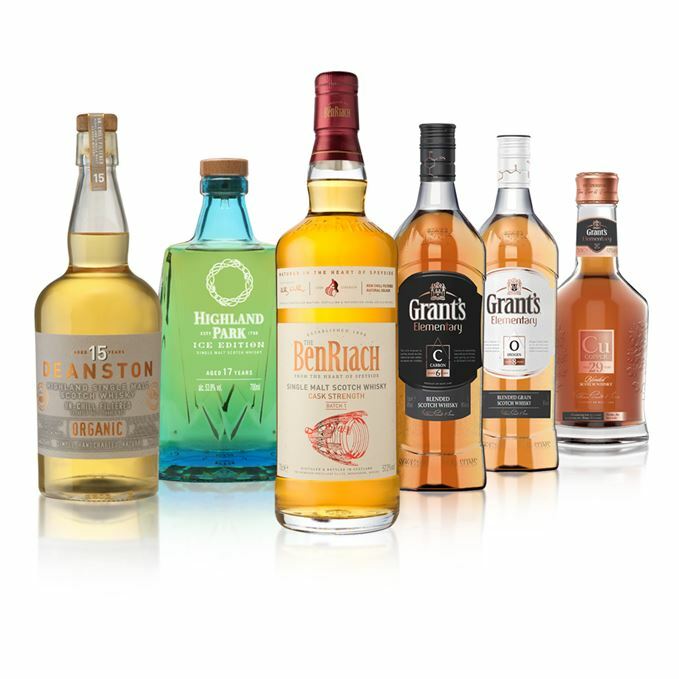 Batch 35 01/04/2016 It’s springtime in new whisky corner as two Bruichladdichs, three Glencadams and a Glen Moray arise.